Safe to Shake dog coats & accessories are very proud to be a part of Pet Shops UK which is home to a huge variety of your pets needs. Pets ranging from dogs, cats to poultry, fishes & reptiles. Please take the time to visit their website www.petshopsuk.co.uk Your every day pet needs are catered for on one site which include pet insurance, pet law firms & alternative therapies. If you own a pet business you can also benefit from advertising on their website. Safe to Shake attends many shows around the country. Feel free to visit us at one of our stands to find out more about our Pet Products. 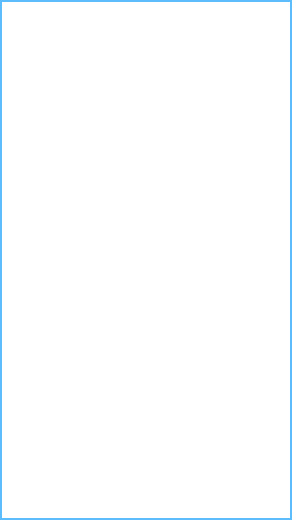 Please fill out our trade enquiries form, email or call for more information. 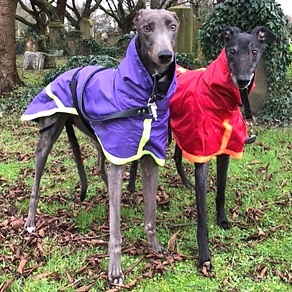 The greyhound waterproof walking coats have been designed with the dogs specific shape & elegant necks in mind. Perfect for sleep overs, gives protection from cold floors & great for keeping seats clean while travelling. Perfect for training your dog & for use with double D ring harness. Ideal for dogs that pull & you need a little more control. Never give up on your pet, look at other ways to give them quality of life. If you care for an older, injured or disabled pet there are solutions for you. Shaped specifically for Dachshunds, keeps your dog dry, especially underneath their stomach &on their front legs. 3 lengths available in one coat, lightweight waterproof material & cotton interior. With pleats at shoulder & a large external pocket. Perfect for puppies, nervous, older & injured pets & ideal for use in crowded places. The Front Pet Carrier is ideal for puppies that have not received all their initial injections yet & injured, nervous or elderly dogs. The full waterproof walking suit has been designed to keep your dog dry, especially underneath their stomach & on their legs. Designed to keep your dog cool in hot temperatures. Water absorbent material slowly releases moisture to keep your dog comfortable . The waterproof walking suit has been designed to keep your dog dry, especially underneath their stomach & on their legs. The collared walking coat is lightweight, warm & waterproof, with added protection for the neck & chest. With pocket & reflective strip. Perfect for helping dry your wet dog, cat & even your horse. When soaked with cold water the fabric is ideal in helping reduce your pets temperature. Our waterproof wear has been designed with dog walking in mind but is also perfect for other outdoor activities. 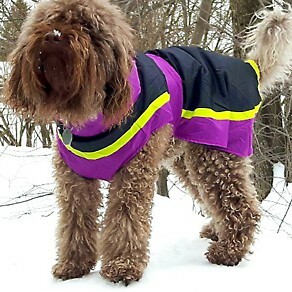 The full body drying coat is designed to dry your wet dog indoors while keeping your home or vehicle dry. The Indoor Drying Coat is designed to dry your wet dog while indoors or in a vehicle. It allows them full freedom of movement & helps to keep your home or vehicle clean. Ideal to keep in your car boot for those unexpected showers or swims while on a Spring or Summer walk. Absorbent microfibre inner - Waterproof outer. Designed to protect your dogs stomach, chest & legs. Adjustable chest & neck circumference. The Safe to Shake cooling coat is designed to keep your dog cool & comfortable in hot temperatures. Perfect for helping dry your wet dog, cat & even your horse. When soaked with cold water the fabric is ideal in helping reduce your pets temperature. Welcome to Safe to Shake - quality dog coats, pet accessories & waterproof wear for owners.